Happy Monday! 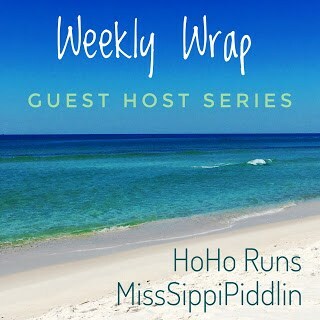 It’s time for the Weekly Wrap with HoHo Runs and MissSippi Piddlin, with guest host Michelle! Well, we did it! We survived back to school and all that came with it! I was mostly worried about oversleeping or forgetting something, but everything went along pretty smoothly, which was a relief. On Sunday morning, little man and I went to my Webelo co-den-leader’s house for a planning meeting/playdate. We were able to work through some rough ideas in advance of our upcoming leadership meeting, and of course, her kids got to play with mine. In the evening, we did a little hot dog and s’mores cookout to celebrate the end of summer. The kids on our street played with water balloons, enjoyed running around and even submitted to having ice water dumped over their heads for an impromptu ALS ice bucket challenge. It was perfect. Little man went to spend the earlier part of the day with his best friend and I went off to work. Since camps are over for the summer, he was going to have much more fun with a buddy than at the office with his dad, so it worked out perfectly. I had to get back on an early schedule, so I made sure to be up and out before sunrise. It was a little odd running in the dark again, but that’s how we do it during the school year. Little man had an incredibly fun day at the beach with our friends, and when I picked him up, we had to do some driving around to pick up some last minute things for back to school. In the evening, it was time for a scouting conference call, to sort out some details for upcoming events. Finally, it was orientation day, and the first day of being able to actually explore our new school. Eek! Since I had work, I helped my fellow PTA parents set up the membership and spirit wear table, and when Mr PugRunner, little man and my parents arrived, we set off to find his classroom, drop off his school supplies and meet his teacher. The classroom was incredibly welcoming, we already adore his teacher and the new school is amazing. With that done, my parents took little man to do a little shopping and get his hair cut and we all met back at the house. Little man wanted Japanese for dinner, so we all went to his favorite place for sushi and hibachi chicken and rice. It was a great meal to end the summer and we all turned in at a reasonable hour. We had pancakes for breakfast, packed lunch, and it was off to the first day of school. We got little man settled in his classroom, chatted with his teacher for a few minutes, and then I helped some of the other teachers and PTA members direct students to their classes (since everything is new, it’s easy to get turned around and some needed assistance finding their way). Mr PugRunner and I had a lunch date and then I baked cookies and made a mac and cheese casserole for after school snack and dinner, respectively. Little man got off the bus all smiles and had a fabulous first day! I know it’s going to be a great year! Day 2 of our new routine, and all was going pretty well. There were a few things I needed to pick up for the weekend and when I got home, Molly was having a really hard time breathing. The vet was able to see her that afternoon. She is 13 years old, and we have been very lucky with her health, but sometimes she scares me. Fortunately, the vet said she was doing great, considering, but that she had an inflamed and irritated soft palate. She got a shot of cortisone and a sedative and we were able to go home and cuddle. With that weight off my shoulders, I was able to make the trip to Jacksonville Beach for the first part of Tour De Pain. Four miles on the hard packed sand at 6:30 PM. It was absolutely brutal, so hot that my phone actually turned itself off due to overheating. Yikes. I left directly after the race, drove home for a shower and a salty burger, and got myself in bed. This was my craziest day to date. I had to be up and out the door at 5:30 for the second part of TDP: a 5K road race at 7:00 AM. Done and dusted. I hustled home, showered and changed, and went into work to cover one of my teammates for a special fitting for a local moms fitness group. It was a lot of fun and everyone was really happy and excited to continue their training. Then it was off to meet the boys at a birthday party for one of our dear friends’ sons at a trampoline/jump park. Obviously, it was tons of fun and we even carried the party over to Whit’s Frozen Custard, a place I have been desperate to try. Ice cream before a sprint is never a great idea but I decided to take the risk, even though I still had the Tour De Pain Mile Sizzler. I had no regrets. I was hoping the boys would join me at the race, but it had been a long day for them too, so they went home and I went on for my final mile. I was VERY happy to get home that night. Lots of miles, lots of smiles and lots of great times this week. It feels great to be back in a routine, and now it’s time to get geared up on some of my long run miles. Apparently, November is coming one way or the other, and I have some half marathons to think about. In other news, Best Damn Race just released their Orlando medals, and I cannot wait to earn some of these! I absolutely love the style and the colors and the shape, and really everything about them! Code RUNPUGS saves you $5 on any Best Damn Race distance in any city, so don’t miss out! Are you ready to start ramping up your miles? I do love running on flat hard packed sand along the water. A light cooling breeze is always welcome too. No breeze to be had. Just heat, humidity and merciless sun. It was not my favorite day LOL! This was actually the best sand running experience I have had in a long time – very level, very packed. I wasn’t even sore afterwards. It’s a lot of fun. Mentally challenging, but in a good way. The Tour de Pain sounds interesting! Glad the first week of school went off well and in a NEW school! We have three more full weeks until school starts here! Interesting is a good way to describe it LOL! We are very lucky that everything proceeded smoothly. It’s tough being at the mercy of construction, but the staff and students have handled everything with such grace. Congrats on surviving back to school. I can only imagine how much that changes up your schedule! I did a half marathon two years ago and the last .1 of the race was on the sand. To say I was annoyed is an understatement! We have a had a few of those with sandy finishes. Usually I don’t mind, but if that sand isn’t hard packed…. nope. It’s a no go. I am finding I am a creature of habit. I tried to be chill and easy going during the summer, but I am grateful to be back on track. Tour de Pain sounds brutal, but also so awesome. I wish we had that up here! Such a busy week, I’m always amazed at how much you all pack into seven days! I’m glad things are starting off great for little man at the new school too! I imagine, at some point, I’m going to unhinge LOL! However, the busier I am, the more productive I seem to be. Weird, huh? I’m glad back to school went well. We were all sad to leave our old school, so the fact that the start of this one has been so positive is a good thing. I love your photos this week! Running on the beach would be amazing. I ran on it once in Cape Cod. It kind of hurt, but it wasn’t packed down sand like what you have there. Bless you for running that much in the sand! I did a one mile run on the beach once and that was enough for me. I’m two weeks in to my new training plan and ready to ramp up the mileage. I’ve tried to keep my base long run between 8-10 over the summer so it would be an easy transition to half marathon training. My biggest increase has been my weekday runs. That’s a good base. I’ve totally slacked on my base this summer, but I’ve been busy with other things, so it’s ok.
Fall races will be here before you know it. Time to up our mileage like you said. Hopefully we will have cooler weather ahead of us soon. I would be grateful for 70s right now, but it is what it is. Onward and upward! My aunts did the Tour de Pain, and all I saw was a picture of their smiling faces at the finish line-I had NO idea it was a three part race and one of those parts being at night on the beach! I have done one evening race at the beach and it was the most miserable I’ve ever been!! Props to you guys! I was smiling at the end, too! Happy to be done with the madness! But yep, that’s the Tour De Pain – three races in 24 hours. It’s something else! Love running on the hard sand, but only when it’s dawn. Anything when the sun comes up is misery! Sunrise beach runs are amazing, for sure. Go get them! You’re going to do great! What a great week. I can’t believe it’s already time for back-to-school. I tearfully watched my youngest back out of the driveway this afternoon for his junior year away at college. Where does the time go??? Aw. Junior year is crazy! Time does fly, that’s for sure! I find it so tough to run on sand – my calves just don’t love it. Great job on getting through the Tour! And yay for surviving the start of school – we’ve still got a couple more weeks to go – I’m not ready yet! Michelle @ Running with Attitude recently posted…Guest Hosting the Weekly Wrap! It’s not easy, that for sure. We do go back early, but things are settling nicely into place, so it’s ok. I’m glad to have a routine again. A busy and active week for you! Those Best Dam medals are pretty. Glad back to school went smoothly. My high schooler started today and my middle schooler starts Thursday so we’re almost there. I love these medals so much! A lot of places are starting school in August. I don’t feel so alone! It was a little painful. I think the worst part is how much it messes with your sleep and how tired you are when it’s over. I’m glad Molly is ok, too. She scared me half to death. I don’t love getting up at 4:30 and 5, but I feel great knowing my workouts are done. It’s hard to believe it’s back to school time already. Those are all beautiful medals…especially the RNR one! LOVE that! Also I love getting out at sunrise. It’s awesome. Sunrise is such a peaceful time to be out. It’s hard to drag myself out of bed in the dark sometimes, but I’m never sorry once I do it. Sand running is tough. Plain and simple. Even the packed sand is not completely solid…I can always feel my ankles twisting and turning in every direction. Back to school (our last hurrah) is next Thursday….how did all my kids get this old??? Sand is definitely a big challenge. I’m a little more used to it, even though it’s not my terrain of choice. Great big week for you! I am sure we are ramping up the miles in September I hope the weather cools off! I saw those Orlando medals- I may have to put that one on my calendar! DOOOOOO ITTTTTT!!!! Selfishly, would love to see you! But also, it’s a great race! My youngest started his senior year of high school. Don’t blink…they grow up. 😉 The tour de pain sounds interesting. I’ve never heard of a series like that. I’ve never tried running on packed sand but the fluffy sand on the panhandle is a NO GO. I hope to be ramping up my mileage in a few weeks. High school seems so far away, but it’s really just around the corner. Yikes. It’s definitely a tough series, but I always find myself registering for it. I guess I’m a glutton for punishment.